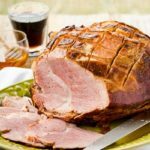 Honey cola baked ham is an easy recipe to make for a flavorful and tender ham that is simply baked with honey and cola (Coca-Cola® brand recommended). Line a roasting pan or large baking pan with 2 sheets of heavy-duty aluminum foil crisscrossed and long enough to cover ham (wide foil recommended). Place ham on the foil. Cut a crisscross pattern in the top of ham. Pull foil up around the ham. Pour cola over ham. Pour honey on top of ham. Seal ham securely with the foil. Amount of servings depends on size of ham. You can generally estimate about 1/3 pound per person for a bone-in ham.